Performers include: Joe Pantoliano, William Baldwin, Mary Stuart Masterson, Larenz Tate, Lyndsy Fonseca, Elisangela, and Amy B. Hill. 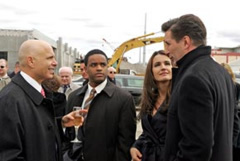 This drama tells the troubled story of the Mayor of Providence, RI (Joe Pantoliano). His ex-Deputy Mayor is being indicted. His Police Chief let a famous baseball player go after a DUI and then the player was involved in a hit-and-run. A witness of the accident is then found dead, shot by a gun stolen from the Mayor’s home. Speaking of home, the mayor also has major problems with his second wife, his youngest daughter and his step-daughter. On top of that, his daughter from his first marriage is the prosecutor in the hit-and-run case. The following were issued by the network. Only five were produced and none aired. The mayor of Providence, Rhode Island, James Centrella is more powerful than the governor. James must juggle his political career, a dirty police chief, and his family. There are no known plans to revive this series. • CBS decided to permanently shelve this drama. Reasons included creative issues, high production costs and limited time slot needs. This was confirmed on October 19, 2006. Image Monty Brinton/CBS ©CBS Broadcasting Inc.